For anyone who thinks Dal is boring, I’m going to change your mind today. Just before I started writing this post, I posted a picture of the Dal on Instagram (are we friends yet?) and oh man! I was expecting a lot of meh’s but all I got was yay’s for this Dhaba Style Dal Fry. So now I’m thinking there are other people who might actually like dal. Hallelujah. But I guess once you start staying away from home, those very things end up becoming favorites. Everything except yellow dal. Am I confusing you, considering this post is about yellow dal? So here’s the thing, I don’t like the regular pressure cooker with turmeric and salt only yellow dal. I want mine to have bold flavors, some tadka (tempering), some masala and only then I’m satisfied. Like this one. My dhaba visits are always a battle. Between deciding whether to order dal fry, dal tadka or dal makhani. Dal fry wins about 40% times. Because dhaba style dal fry is smoky and spicy and indulgent and perfect with crisp tandoori rotis. All you need is some sliced onions on the side and a squirt of lime juice. And you are set. The secret to this OMG dhaba dal fry is butter and kasuri methi. Trust me, those two just turn regular dal into awesome dal. The steps to making this recipe are pretty simple and totally doable on a weekday. So no extra prep needed, no last minute grocery trips because as long as you have the basic pantry staples, you should be good to go. Plus it really doesn’t take too much time, and you will have finger licking goodness on the table in under half an hour. 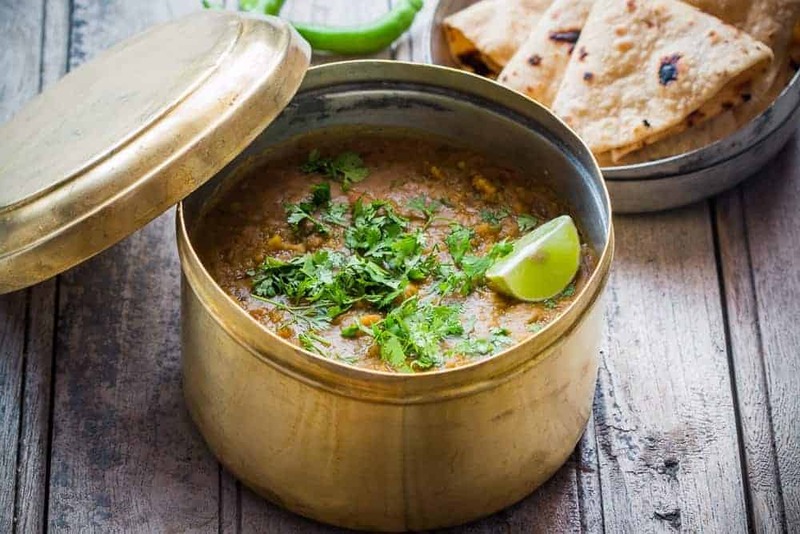 Dal Fry is usually a thick dal, unlike dal tadka but you are the boss of your dal so feel free to change things up slightly and just use this recipe as a guide. Now if you are crazy about dhabas or dal fry or dal tadka or just food in general, give me a follow on Pinterest and Instagram where I share my daily food inspirations and foodie finds! 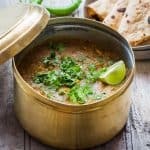 Spicy, smoky and really authentic Indian punjabi dhaba style dal (lentil curry soup) fry. A quick 30 minute recipe which is wholesome and healthy. Pressure cook the dal with 2 1/2 cups water till completely cooked through and can be mashed easily between two fingers. Use a wire whisk or spoon to mash the dal further so it’s almost smooth. Heat oil and butter in a pan and smashed garlic. Fry the garlic till light brown, without burning it and add the slit green chilies, ginger and garlic paste. Cook for 30 seconds and add onions. Stir fry the onions till they are translucent and add tomatoes, spices and salt. Cook till the tomatoes completely break down and become pasty. At this point, stir in the dal along with some water if required. Bring this to a boil and simmer for 5-7 minutes. Dry roast the kasuri methi in another pan for a minute or so. Grind it to a powder and mix it in the dal along with juice from the lemon. Switch off the flame and stir in chopped coriander. Serve hot with rice, pickle, sliced onions and rotis. Hey Neville, thanks for catching that. I’ve fixed it. I meant add all the spices. Nice recipe. Less complicated than some others, though still great taste. Hello! Currently making your dal makhani recipe (instant pot version) and exploring the other recipes on your site. How can I adapt the pressure cook recipes to the instant pot? Hey Daniella, it’s a little difficult to say because each recipe will have its own cook time. If you have a specific recipe you want to try out, I can help you out with the conversions. Awww you are so sweet! Thank you! 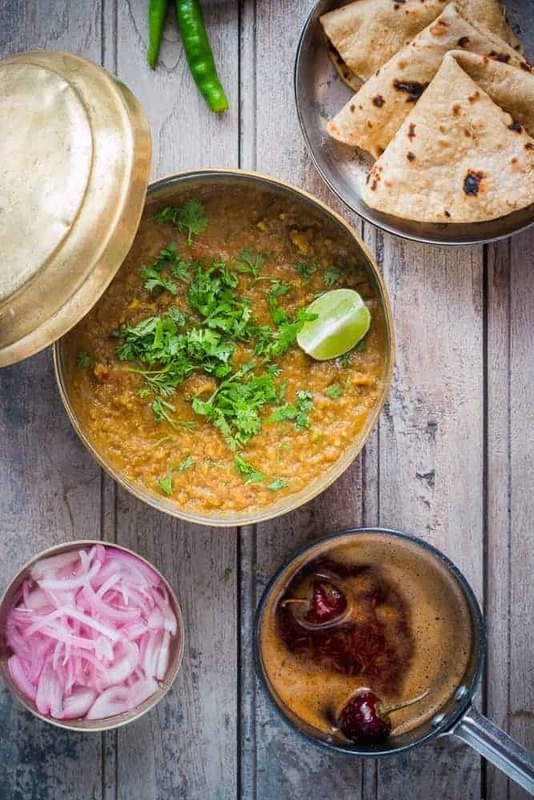 Dhaba Style Dal recipe is indeed a tasty recipe. I will surely try making this and I reckon that putting that dhaba essence in that will be a difficult thing. Thanks Geet! I hope you like it! 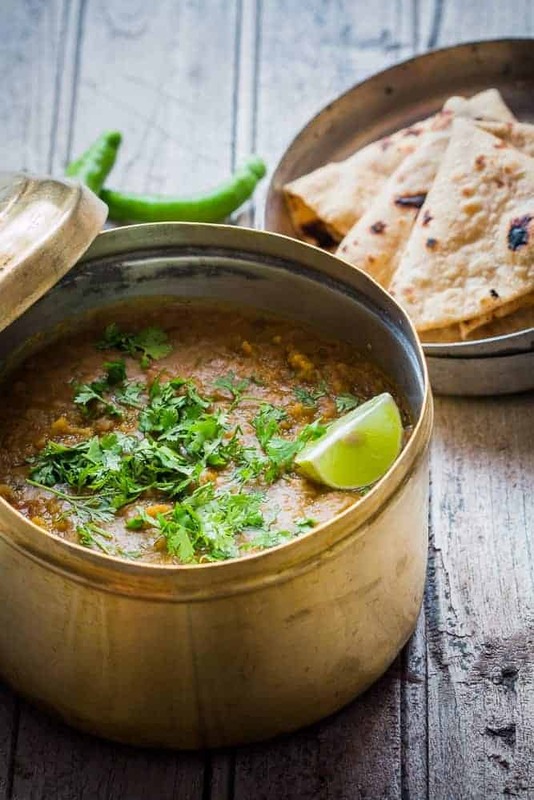 What is the difference between dal fry, dal tadka and dal makhani? Delish delish! I tried this recipe and it came out beautifully well! Spot on! Perfect with plain basmati rice! I’m so glad you liked it Pama! Hey Richa 🙂 I followed your recipe with a few small changes to the tadka, and followed the process with the dhungar method of smoking. I cannot tell you how much it tastes like authentic dhaba dal. You simply must try it! In case you haven’t tried it already, I’ll outline the process for you. All you need to do it place a small katori in the middle of the dal dish (making sure it doesn’t sink right in), place a small piece of red hot charcoal in the katori and then pour a teaspoon of ghee over the hot coal. As soon as it starts to smoke, seal the dal dish with a lid and let the smoke impart its flavor to the dal. After the smoke has settled, remove the lid, discard the coal, pour the ghee from the katori into the dal and mix well. You’re gonna love this! Richa di, can I call you Richa di? (I’m just 16) This dal was bomb! So true to the dhaba spirit. And I love your blog, going to try the eggless-boisterous-Karan brownies soon. Hey Richa, I can so relate to your yellow dal story, it was a regular In our house too.. you also reminded of my college time , when dhaba trips were regular.. Thanks for the lovely post and pics.